Key Points Figure 1 Footnotes ➤ Primary ciliary dyskinesia (PCD) is a genetically heterogeneous, mainly autosomal recessive disorder characterized by motile cilia dysfunction. ➤ Clinical manifestations of PCD include chronic upper and lower airway disease, left–right organ laterality defects, and infertility. ➤ The diagnosis is often delayed, even in children who have characteristic clinical features of PCD, as clinical features of PCD can overlap with other conditions, such as cystic fibrosis (CF), immunodeficiency, pulmonary aspiration, asthma, and recurrent viral respiratory infections. However, PCD is not a diagnosis of exclusion. 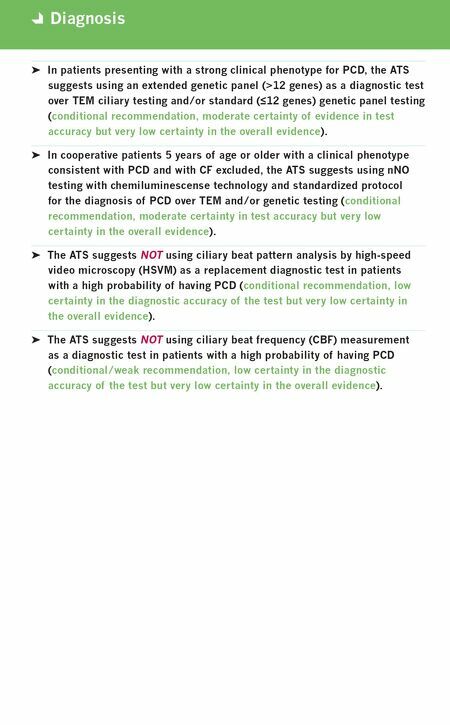 ➤ There is no universally agreed-upon "gold standard" for diagnosis, and no single modality has sufficient diagnostic sensitivity and specificity when applied to the general population. ➤ Recently, investigators identified four key clinical features characteristic of PCD: • Unexplained neonatal respiratory distress in a term infant • Year-round daily (wet) cough beginning before 6 months of age • Year-round daily nasal congestion beginning before 6 months of age • Any organ laterality defect a Cystic fibrosis should be ruled out before performing nasal nitric oxide (nNO) measurement, as roughly one-third of CF patients can have nNO values below PCD diagnostic cutoffs. nNO measurements should only be performed with chemiluminescence analyzers using standardized protocols at centers with specific expertise in nNO measurements. Some nNO analyzers have not received approval from federal agencies worldwide (U.S. Food and Drug Administration and Health Canada have not approved all chemiluminescence devices for clinical use), which may have implications for clinical implementation. b Genetic panels testing for mutations in more than 12 disease-associated PCD genes, including deletion/duplication analysis. c As nNO levels can be significantly decreased by viral respiratory tract infections, a repeat nNO measurement, at least 2 weeks aer the initial low value (expert opinion), is recommended to ensure that the initial low value is not secondary to a viral process. 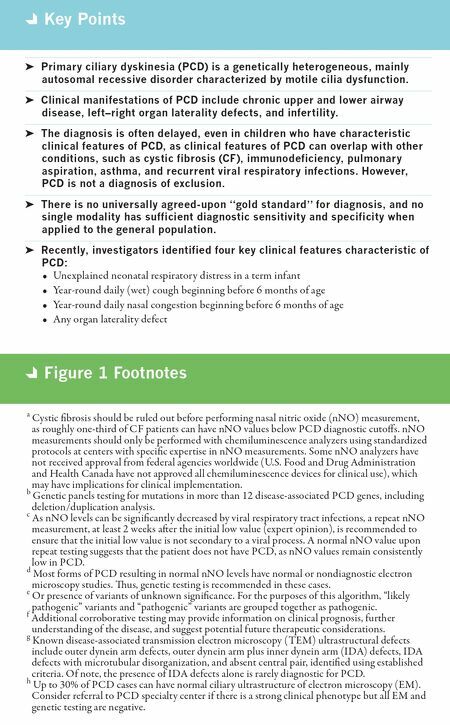 A normal nNO value upon repeat testing suggests that the patient does not have PCD, as nNO values remain consistently low in PCD. d Most forms of PCD resulting in normal nNO levels have normal or nondiagnostic electron microscopy studies. us, genetic testing is recommended in these cases. e Or presence of variants of unknown significance. For the purposes of this algorithm, "likely pathogenic" variants and "pathogenic" variants are grouped together as pathogenic. f Additional corroborative testing may provide information on clinical prognosis, further understanding of the disease, and suggest potential future therapeutic considerations. g Known disease-associated transmission electron microscopy (TEM) ultrastructural defects include outer dynein arm defects, outer dynein arm plus inner dynein arm (IDA) defects, IDA defects with microtubular disorganization, and absent central pair, identified using established criteria. Of note, the presence of IDA defects alone is rarely diagnostic for PCD. h Up to 30% of PCD cases can have normal ciliary ultrastructure of electron microscopy (EM). Consider referral to PCD specialty center if there is a strong clinical phenotype but all EM and genetic testing are negative.